*Giveaway for $300 worth of Reversa Skincare for your skintype below! Open to Canadian residents only. If you've been with me for a while, you know that I have been using Reversa for a few years now. I reviewed the Reversa Solution for Acne Prone Skin last year if you are curious. It's a Canadian brand, which I am also so happy to support and test out. If you'd like more Canadian brands I have a Canadian Beauty Series on my YouTube Channel! The brand began in the 80s, and primarily focused on anti-aging skincare. Reversa was one of the first brands to include glycolic acid in its products. Glycolic acid is a skin penetrating AHA that will stimulate skin exfoliation (chemical exfoliation) and promote cell regeneration which will in turn leave you with better skin! More recently they've begun to release products for acne-prone skin, primarily adult acne. For reference, I have oily and acne-prone skin. I have had acne for basically as long as I can remember. I believe grade 5 was when it all started, on my forehead. Then later it moved away from there and onto my nose and chin. Currently, at the age of 26 it is still working it's way onto my face but more so on my cheeks. Forehead is as clear as can be! I honestly still cannot believe it is something I still have do deal with, I thought it was a pre-pubescent thing, then a teen thing, then a young adult thing .. but turns out it is just a me thing! 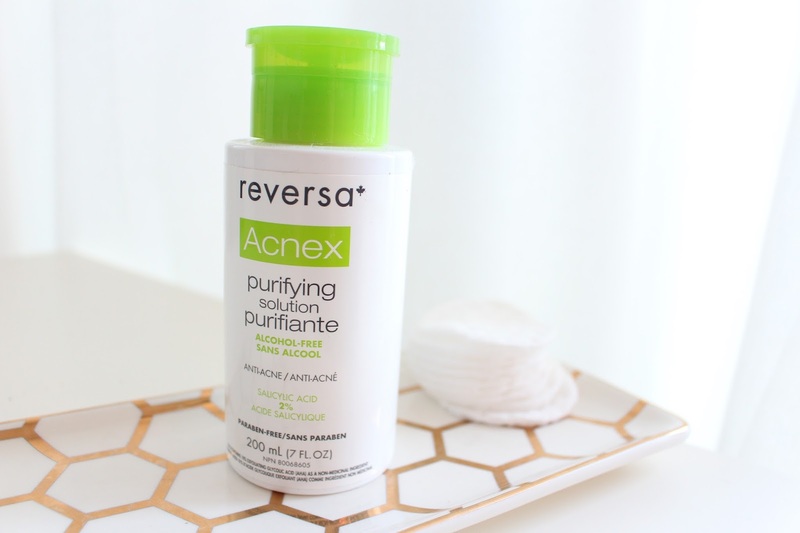 The Reversa Acnex Purifying Solution retails for $29 CAD on their website or it can be found at Shoppers Drug Mart. You get lots of product in there, 200mL, and I love the ease of use top. You just flip open the top, push your cotton pad on top and it dispenses just enough product. It can be really easy to use too much and waste products like this when they are in other formats. 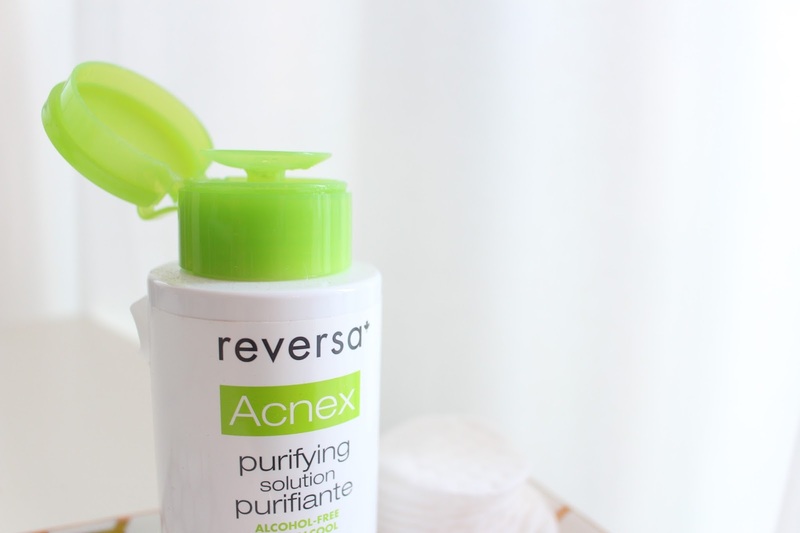 Reversa Acnex Purifying Solution was made to tighten and unclog pores along with dry, eliminate and prevent future acne. If your skin is sensitive it is formulated without parabens, oils, perfumes and is alcohol free. It's not tested on animals either, that is always a plus in my books! When looking at the ingredient list, it's nice to see it is not a gigantic list. They seem to just put in what needs to be there, and nothing else. It's formulated with 2% salicylic acid (BHA) and 10% glycolic acid (AHA). 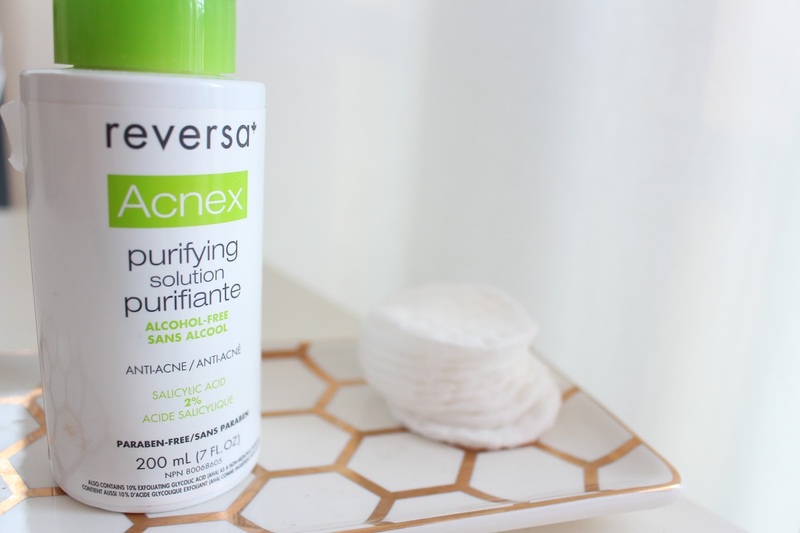 The Reversa Acnex Purifying Solution is listed as having the "maximum concentration of salicylic and glycolic acids allowed in an over-the counter (OTC) product". My experience with this product has been great. I use this twice a day, after cleansing. Sometimes I get a slight tingle after application, but I love that - feels like it's doing something. It does not leave a residue on my skin, or leave it feeling dry or irritated. I have no problem using it under makeup either. It leaves my skin feeling, clean and fresh. My skin has been pretty agreeable lately in the way of acne, I mean I still get a random one pop up here and there but as for clusters of active breakouts, they are just about non-existent. After use I always follow up with an SPF, when using products that contain salicylic and glycolic acids your skin is reproducing and turning over cells and needs to be protected! Reversa makes a great one, the Reversa Radiance Cream with SPF 30. You don't want to spend all this time taking care of your skin, only to have it go to waste by skipping SPF! My skin type is oily for sure. But not super acne-prone. Maybe leaning more combo in the winter. As I get older, I am learning the importance of skincare and funny enough, a friend of mine was JUST recommending Reversa to me, so I would love to try them out! Combo skin. I am oily and dry. Sorry made the mistake of pushing enter too many times. Please let me know how I can remove my extra comments? My skin type is fairly normal, leaning combination. It's so wonderful to see a product like this that's available to oily skin Canadians, like me, without crazy shipping costs. My skin type is combination oily! I have combination skin. Hate it so much! I have a combination, acne prone skin. My skin is combination, leaning towards dry. I get lots of little bumps on my skin and dry flakiness in my t-zone. I have combination skin that sometimes breaks out. My skin is getting drier as the winter approaches. I'm a total greaseball in the summer-applying foundation is terrifying. But when the cold comes, it seems to zap all the moisture out of my skin. Combo skin!! normal on the outside, oily in the T-zone :( the struggle! My skin is combo to oily. It has actually become very frustrating trying to deal with my skin lately and putting makeup on is a nightmare right now. My skin is combo/oily and acne prone skin, so I feel you!! Thank you for the chance, would love to try more Reversa products! I have very very oily acne prone skin and this sound like exactly what I'm looking for! I have dry texturized skin with uneven skin tone (dark spots). I also have large pores. My skin is oily and acne-prone. Love your oily skin diaries! My skin is a mess right now because it seems like it's transitioning from oily to combo/dry. May be because I moved to a different climate. My skin is oily, but not SUPER oily. Oily enough that I have a lot of breakouts. My skin type is oily. My skin type is oily/ acne prone and I am super excited for this giveaway! I have Combination skin but it tends to get a bit dryer during the Canadian winters. I also suffer from Melasma so treating it tends to dry my skin out more. I have oily acne prone skin in my t-zone and normal on the rest of my face. I have combination skin and lately my skin has been very drying because of the weather here. My family also started noticing a huge difference with the appearance of my face. I would definitely love to try out this brand. I have combo skin I think. I don't know I've been having a hard time figuring my skin out. I definitely get oily in my t zone, and I have large pores, and I'm acne prone. Kind of frustrating, but I've tried revert skin care and some of the stuff has really worked for me! I have combo skin. Even if I don't win, I'll definitely look into Reversa. I need a new toner anyhow! My skin is combo lending dry but really depends on the season. I can get quite oily in the summers and extremely dry in the winter. It can be such a pain because I general have to switch between foundationa or powders depending on the season. I have oily skin and acne pro skin. Id love to get this set. Thank you! i have dry/combo skin in the summer but in winter it's just dry. i think! i feel like it's been changing lately as i've been upping my water intake, though i'm sure it's always gonna be somewhat dry lol. I have combination skin and acne pro. I have use a lot of products before, with no success :( . Id love this set!! My skin is oily. Thank you for the opportunity! i've got veryyyyyy oily skin! acne prone especially during "that time of the month". So excited for this giveaway from a canadian company! cant wait to go check them out at shoppers drug mart tomorrow! My skin type is combo leaning dry (stupid winter) with acne. I understand the adult acne struggle, I'm almost 28 and still dealing. Thought I had it under control with Paula's Choice products, but my skin is currently full of painful spots. Over it. I'm in the in between stage of going from very oily and dehydrated to normal-ish. So, at this point I'm combo. My skin type is combination (drier and tight on the cheeks, and oilier in the t-zone). Also, thank you so much for showing some Canadian brands, its really appreciated since it is much harder to come across in the youtube world. I believe I'm combo skin but tend to lean towards oily. I have PCOS so I still do get breakouts. I have combination skin. Oily t-zone, dry cheeks, and I struggle with hyper-pigmentation from old breakouts, especially on my cheeks-area. My skin type is oily, with lots of texture. Combination. Bah! Breakouts on my chin. Dry cheeks. I think my skin is normal but 'maturing' - thanks! I have oily, very acne prone skin. My skin type is dry with some red patches. My is dry, but my daughter's is extremely oily.